Thank you talk all of the attendees to Intranet Now 2018 for your contribution to the event. 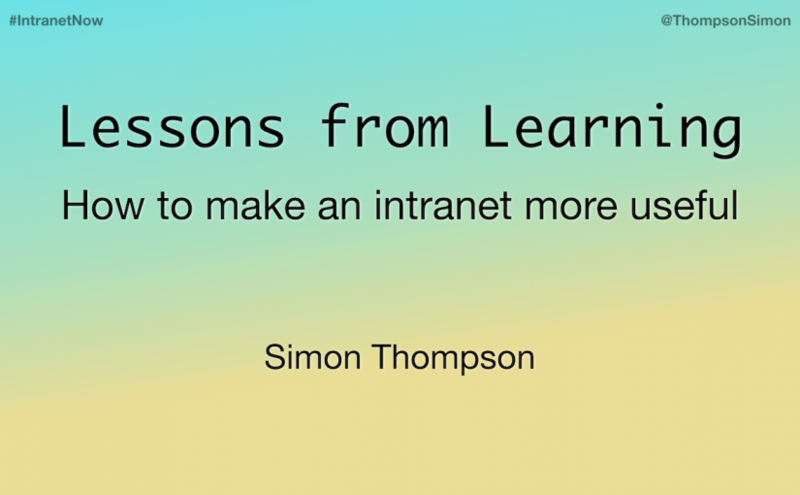 Here are my slides from the event, on the subject of how the integration of learning can make an intranet more useful. I would value your questions and comments as I plan to continue studying and writing about the intersection between intranets and learning. I hope to find out what best practice looks like. Here are a few links to people and articles that helped me prepare for this talk. A New Paradigm For Corporate Training: Learning In The Flow of Work is an interesting description of the learning technology market, and how it’s changing. The Learning Experience Platform (LXP) Market Expands covers the rise of tools that replace or supplement LMSes that better reflect the way people learn, and the needs they have for recording their learning. Jane Hart’s annual list of the most used tools for learning. It might be a surprise to see YouTube and Powerpoint as the number ones in Personal and Professional Learning (PPL) and Workplace Learning (WPL) respectively, but perhaps it shouldn’t be. In-depth article on digital skills in the workplace. Lee’s writing is recommended. A short blog post with some good quotes, and a brief overview of the burgeoning workplace training industry. Harold Jarche writes broadly on learning, and PKM is the technique he has developed. I have found some value in this, but others speak very highly of it. Technically nothing to do with learning, but everything to do with making a service useful and usable.